During your turn, all of your "Blaster Blade" on the same column as this unit get Power +5000. The two Wingals (left) and two Gojos. (Right) Stardrive and Crested deck versions have lower base power. Higher-definition images from Wednesday's bombshell announcement of a Cardfight!! Vanguard reboot series reveal a surprising fact about the upcoming first trial decks for the series, V-TD01: Blaster Blade and V-TD02: Dragonic Overlord. The Wingal and Dragon Monk Gojo promotional cards packaged with the decks have higher base power, tweaked effects, and different background art compared to the ones being used in the official demos of the game. "When boosting, if you have more rearguards than your opponent, during this turn, the boosted unit gets Power +3000." "When boosting a vanguard, during that battle, this unit gets Power +5000." "During your turn, all of your "Blaster Blade" on the same column as this unit get Power +5000." The sample image text compared with the phrase "on the same column." While the resolution of the images is high enough to distinguish most of the text, "on the same column" should be treated as a tentative translation, as it's difficult to make out if the kanji really matches this phrase. Moreover, the promo card images are too low of a resolution to gauge their card numbers. Vanguard has had multiple cards with the same name and radically different skills in the past, but usually separated by months or years. If the new Wingal really is as he appears to be, it's an upgrade competitive Royal Paladin fighters will be scrambling for. 8000 power grade 1s are sorely desired by those that have tried the new format, as while grade 2s have received a power bump to adjust for grade 3s being inflated into crossride-levels of base defense, the same can't be said for grade 1s as a whole. Original image uploaded by @Bushiroad-Global. Note the Force Gift Markers near the edge of the table. More than 300 locations "worldwide" are participating in the demo caravan campaign, which for the English game is set to begin in June, closer to the launch of the trial decks and first booster set. 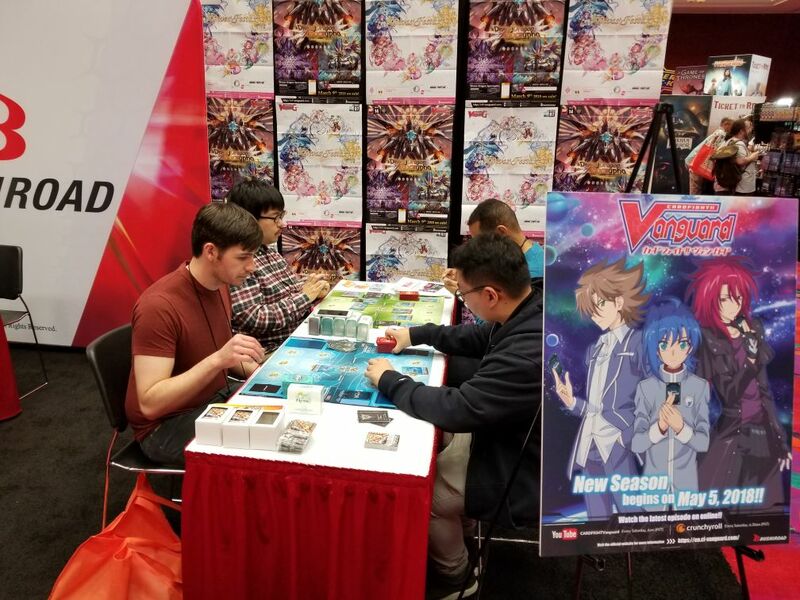 The first location to demo the English versions of the cards at all was the GAMA Trade Show in Reno, Nevada, over March 14th-16th. (Simultaneous demonstrations were held at Akihabara Gamers.) No English-language schedule of events has been released yet, while Japan has 318 such demonstrations scheduled in the months leading up to the May launch. 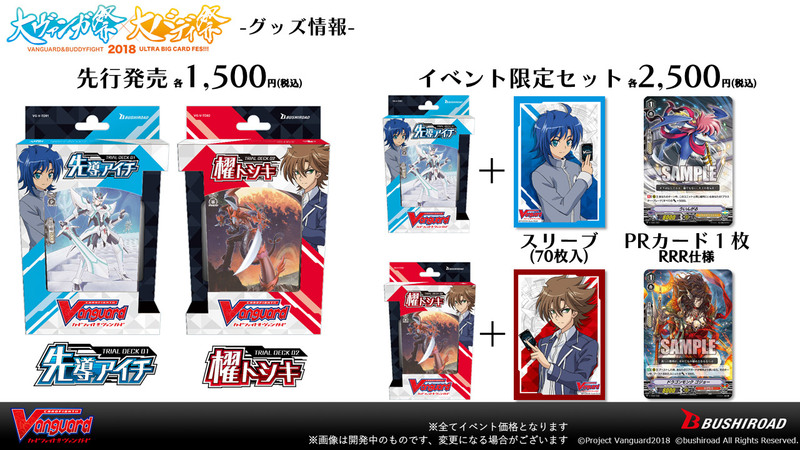 In Japan, the upgraded Wingal and Gojo will be distributed as part of a special bundle of one of the trial decks, a set of 70 card sleeves featuring Sendou Aichi or Kai Toshiki, and one copy of the promo card itself sporting an RRR-rarity foil. It's possible but not yet confirmed that non-foiled versions of these cards will also be in the Trial Decks, which are set to include four copies each of Blaster Blade, Dragonic Overlord, and their respective perfect defense cards. An English distribution for the promo cards has not yet been announced. V-TD01: Blaster Blade and V-TD02: Dragonic Overlord will launch in Japanese May 11th, 2018, and in English June 8th, 2018. V-BT01: UNITE! TEAM Q4! will launch in Japan May 25th, 2018, and in English June 22nd, 2018.